Extras! Extras! You Want to Be in a Movie? Now’s Your Chance! Did you know that a film is being made right here in Frankford and Kensington? Did you know the name is of the film is Voiceless? It is a pro-life movie and the producers and casting director as asking if you just might be the right person to be an extra in this movie. Before you decide, there are some things you need to know. There are no speaking parts available. There will be a meal and snacks provided. You will not be paid as an extra – just a chance to make a good movie and maybe even save some lives. Please read everything through carefully and if you’re interested, please email or call. 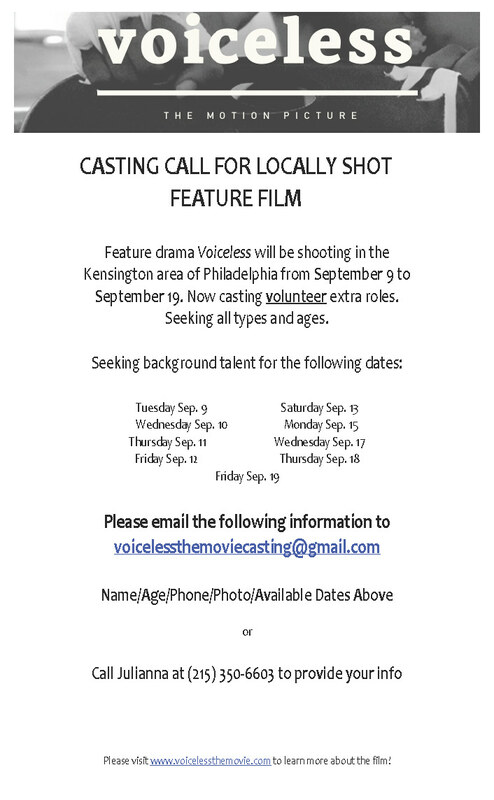 Be sure to have the information ready, the extra casting director needs – Name/Age/Phone/Photo/Available Dates. The most people will be needed September 10th and 11th! Good luck! Tell them Keep the Faith in Frankford sent you! Remember, if you’re chosen, I’ll be expecting free tickets!!!! All background roles are non-speaking. Some roles are ‘featured extra roles’, which means you are seen more front and center in the scene. Shoot days are very long and can range any where from 5-12 hours depending on the scenes being shot. We ask that background talent please bring something to do in the down time. Although they are long days, they are fun! Official call times for each day are not decided until the night before each shoot date. Sometimes call time can be as early as 5am, but rarely is so. Sometimes call time can be late afternoon between 12pm-4pm. Timing is always determined by the previous day, the time we have each location, among many other factors. Once I get a confirmation that an individual can join us for a day of shooting, I take their name and number and put them on a list to receive the official details via phone call the night before that date. The official details include call time, location to report to, wardrobe specifications, and any/all details they will need to know for the day. Locations will always be in Philadelphia, and mostly around the Frankford/Kensington area. This is a volunteer gig. Snacks and drinks are provided on set, and a meal is served for cast, crew, and background talent after eight hours of work. We will ask that background talent provide their own wardrobe, and we will provide wardrobe guidelines to follow the night before the shoot. This film is modern day and takes place in North Philly, therefore wardrobe will be easy to manage and not over the top. We will ask that upon arrival background talent fill out a release form and have their photograph taken with that form. The form simply states that the individual has given us consent to use their image in the film. When background talent arrives on set, they will ask for Julianna, the Associate Producer and Extras Casting Coordinator. She is assisted by three interns, Dennis, Tessa, and Teyquil, who will help background also with anything they might need.